Description: Increase the value of your home and Decorate with Nature! 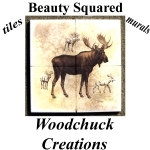 Woodchuck Creations decorates pre-manufactured ceramic tiles. These tiles and murals can be used as kitchen backsplashes, in bathroom showers, spas, as accents or other tile applications. The decal art, which is chosen from the finest worldwide sources, is hand applied and kiln fired to 1450 degrees at our location. It is as durable as it is beautiful. The deep rich colors are waterproof, heatproof and fade resistant. Popular scenes include birds, fish, horses & wildlife. You get the durability of kiln fired China paint at dye sublimation prices. 12x12 Decorative Ceramic Floor Tiles can also be used as a one piece Mural or Backsplash. Free US Shipping and Satisfaction Guaranteed. An example might be a Buck Deer Ceramic Wall Tile. This is a decorative ceramic wall tile for use in the bathroom or kitchen shows an image of a large buck standing in a meadow in the cold winter mountains. The background is light lavender and blue. Meta Description: Increase the value of your home with picturesque ceramic tiles and murals for kitchen backsplashes, bathroom showers and spas. FREE Priority Mail shipping in the US.